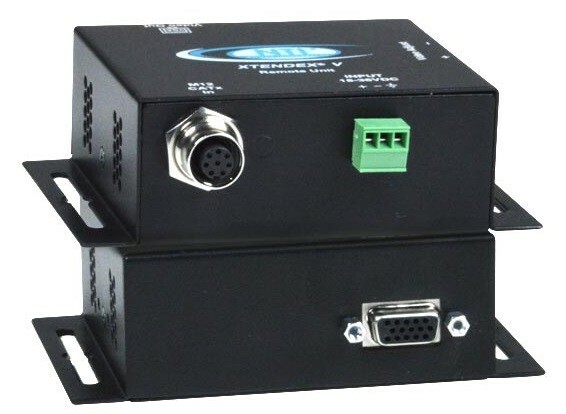 The VOPEX® Industrial VGA Video Splitter/Extender simultaneously broadcasts high-resolution video from one computer to 4, 8, or 16 remote monitors located up to 600 feet (183 meters) away using CAT5/5e/6 cable with M12 connectors. It is available with optional audio. 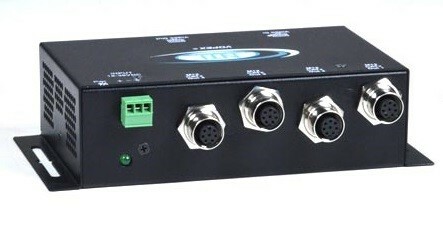 The VOPEX® Industrial VGA Video Splitter/Extender simultaneously broadcasts high-resolution video from one computer to 4, 8, or 16 remote monitors located up to 600 feet (183 meters) away using CAT5/5e/6 cable with M12 connectors. The robust M12 connector system is ideal for rail transportation and harsh industrial environments where reliable connections are required. VGA video splitter/extender system has two components: the VOPEX-M12V-x VGA broadcast unit, which connects to the host computer and also supplies video to a local monitor, and an XTENDEX® ST-M12V-R-600 remote unit for each remote monitor. The units are interconnected by CAT5/5e/6 cable terminated with M12 connectors. Supports resolutions up to 1920x1440. Optional audio can be broadcast to self-powered stereo speakers at the local unit and each remote location. Meets the electrostatic discharge (ESD) immunity requirements of IEC/EN 61000-4-2. M12 connectors resist vibration and provide reliable connectivity in harsh environmental conditions. Flexible Zero-RU mounting, mounting tabs included. Ideal for digital signage, passenger information systems on mass transit, train stations, industrial environments, airports, and other applications that require multiple displays with reliable robust connections. Supports a computer with VGA video. Horizontal: 15 to 130 kHz. Female 8-pin A-Coded M12 connectors for CAT5/5e/6 cable to remote units. Crisp and clear 1920x1440 video resolution. Terminal block for stereo audio connections. 3-foot (0.91-meter) VGA cable included. Use CAT5, CAT5e or CAT6 UTP straight through cable for TIA/EIA-568B wiring terminated with 8-pin male M12 connectors (not included). Use M12-8PWTP-M-FA to terminate both ends of CAT5/5e/6 cable. 18~36 VDC via 3-pole detachable screw terminal. When using CAT6 cable, some degradation may be experienced, depending on the construction of the cable. Video quality adjustment for different lengths of CAT5/5e/6 cable done manually. "We mainly bought from NTI because of your wiliness to adapt your existing product with our M12 requirements. The ease of which NTI adapted and changed their existing product was impressive and greatly appreciated! We can now use your VOPEX-M12V-4 and XTENDEX ST-M12V-R-600 in our future projects. (Before there was no chance of using your products.) For the current project, we'll be using them in 2 halves of a light rail train. First half gets 2 LCD displays with second half getting 2 other LCD's all showing the same image from one controller. By using your splitter/extenders, we will be saving considerable amounts of money by only having to use 1 vs 4 controllers to run these 4 LCD displays."